You need to celebrate with your soul mate. And Valentine’s Day is the celebration of love and affection. Always welcome–a sweet gift, a romantic card and flowers are traditional–to let them know you love them. And other gifts of wine, jewelry, even PJs or a cookbook-for-two would be meaningful. 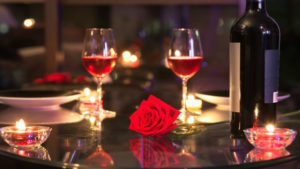 But a romantic getaway to Wilmington, NC is the quickest way to your sweetheart’s affection for Valentine’s Day. (And I must say, the gifts are nice too!!) A gourmet dinner out at a special restaurant is my favorite so I don’t have to cook! Wilmington has some remarkable restaurants which we highly recommend for date night. Be sure to make reservations in advance (and I mean now!). These are the best restaurants in Wilmington. And, if you want, you can dress to impress, but Wilmington is a tourist town and dress can be casual. Manna Avenue – specializes in serving scratch-made, seasonal New American cuisine. From Open Table: “The restaurant features a posh space with a full-service bar serving craft cocktails and wine.” This is a AAA 4 diamond rated restaurant and they don’t ‘toot their own horn’ about it. Caprice Bistro – This is Classic French with a Belgian twist and daily specials. One diner exclaims “Delicious but try to save room for desert”. I think this should be a AAA 4 diamond rated restaurant! PinPoint Restaurant – From their website: “serves food deeply rooted in Southern tradition and foodways. Chef Dean Neff’s menu changes daily and features local seasonal offerings from Wilmington’s farmers, fishermen, oystermen, and crabbers as much as possible.” Another winner in Wilmington. Rx Restaurant – From Our State Magazine: “At Rx, Wilmington’s pharmacy-turned-restaurant, the atmosphere is modern, but the food philosophy is as old as Southern cooking itself.” This is truly a farm to table, local restaurant with true southern flair. The menu changes daily depending on what is available at the market. The first heart-shaped box of chocolates was introduced in 1868. 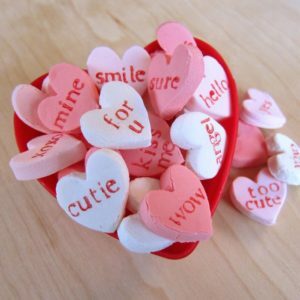 Today, more than 36 million heart-shaped boxes of chocolates are sold each year. That’s 58 million pounds of chocolate. Necco Sweethearts — a.k.a. conversation hearts — were invented in 1866. Reserve your Valentine’s romantic getaway now at C.W. Worth House Bed and Breakfast in Wilmington, NC. We are located within walking distance of the Historic Downtown along the Cape Fear River. This entry was posted in dining in wilmington, Holiday, weekend getaway by Doug Erickson. Bookmark the permalink.